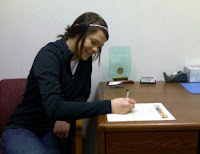 Molly McNea, a current freshman soccer player at UNO signed a letter of intent with the Flames, yesterday, March 12. Molly will be transferring to join the CSM nursing program in the fall. We are very excited for Molly to be a part of the Flames Family. She played indoor with us last Sunday and even scored a goal! Molly is a 2007 grad of North Platte High School. Yep, that is the same school that current player Hillary Brown attended and the very same school that 2009 recruit Megan Tuenge attends. It seems that we have a NP pipeline going on at CSM. Molly was a four year letter winner for North Platte and scored 13 goals and 6 assists as a senior. Molly's parents are Melvin and Michelle McNea and she has two brothers.